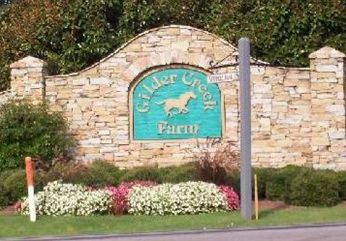 The Gilder Creek Farm community is comprised of 378 homes made up of four sections: The Meadows, The Oaks,The Glenn and The Valley. Entrance signs and decorative street signs feature a horse silhouette, and streets boast apple-related names, such as Honey Crisp Way, Red Rome Court and Ginger Gold Drive. The community members enjoy the walking trails, open areas, sidewalks, street lights, clubhouse, playground, junior olympic pool and friendly homeowners. This is an active community with large and small families. The elected Board of Directors is comprised of 7 members to oversee the day to day operations of the community while working with their management company.